Computers and cell phones are basically an additional appendage yet very few movies manage to incorporate tweeting, texting, Skyping, etc. in a way that feels natural. However, Levan Gabriadze nails it in Unfriended. The movie focuses on six friends, Blaire (Shelley Hennig), Mitch (Moses Jacob Storm), Jess (Renee Olstead), Adam (Will Peltz), Ken (Jacob Wysocki) and Val (Courtney Halverson). 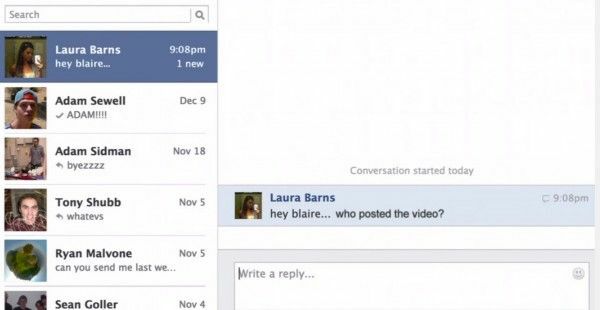 They start up a group Skype call and shortly after, they get messages from someone claiming to be Laura Barns (Heather Sossaman), a girl from high school who committed suicide a year ago after someone anonymously posted a nasty video of her. Now “Laura”/billie227 on Skype wants vengeance. If they don’t come clean about what they’ve done, she’ll kill them. The whole entire movie takes place on Blaire’s computer screen during the Skype video call with the other characters. Occasionally she navigates over to iMessage, sometimes she checks Facebook and every once in a while she turns on a song via Spotify. That probably doesn’t sound too thrilling, but it does work because all of her actions are motivated. Even before things get creepy, the format is surprisingly engaging and dynamic. While watching a video on YouTube, she switches it to full screen at the precise time any user might. She writes her boyfriend Mitch a message, assesses it before hitting send and then edits it, again, just as anyone might. And things continue to feel surprisingly logical and relatable even when they get to the more extreme and horrific parts of the film. You know that familiar feeling you get while watching a horror movie and catch yourself thinking you’d make a better choice than the characters do? For the most part, that’s impossible here. First time feature writer Nelson Greaves does an incredible job making the characters feel completely helpless. If they disconnect, billie227 will kill them and it’s a brilliant limiting factor that winds up forcing them to make decisions that seem completely logical given the situation. On top of that, it also gives Unfriended an especially unnerving claustrophobic quality. Billie227 essentially has the characters trapped and thanks to the wildly impressive cinematography, you feel trapped right along with them. Gabriadze and cinematographer Adam Sidman do some astounding work with extremely limited locations. There’s no cheap tricks like cutting to security cam footage to offer more perspective. Gabriadze, Sidman and editors Parker Laramie and Andrew Wesman just build suspense through solid shot composition, simple yet extremely effective blocking, and spot-on sound effects. In fact, sounds like the Facebook messenger chime, the Skype incoming call jingle and the Mac reminder alert are so well timed to the scares in the film that when I came home to write the review and my iCal sent me an alert for an event tomorrow, I jumped. The only element of Unfriended that’s a little disappointing is the ending. For the sake of not spoiling the movie, I’m going to be extremely vague here, but it just isn’t satisfying from a narrative perspective. There’s something admirable and interesting about Greaves’ somewhat understated approach to this element of the film, but I actually suspect it would have played better had it come with a more pronounced build. The characters are also a bit underdeveloped, but strong performances all-around keep that from being much of an issue, especially with Hennig and Wysocki. Ken is very much a supporting character, but Wysocki steers clear of cookie-cutter high school stereotypes and sells him as a smart, unique guy who could actually get them out of this scenario live. As for Hennig, she’s an especially natural, likable lead. No matter how well Unfriended is shot and edited, there’s no way you’d get this much access to Blaire without high quality work from Hennig. Unfriended isn’t perfect, but it is one heck of an accomplishment. Not only is it an entertaining thrill, but it also gets inside your head and, I must admit, that has a lot to do with the way Gabriadze and Greaves decided to end the film. Again, it didn’t quite work for me in the context of the story, but by incorporating that idea, I’m now sitting at my laptop with my heart skipping a beat every single time I get an alert or message.